Every once in a while, I see commercials advertising a taco that is a crunchy shell and a soft flour shell stuck together with cheese. I have always wanted to try one and when I finally got around to it, the place didn't have them anymore (or maybe I was at the wrong place?). It must be a limited edition menu item or something that they bring back occasionally? I was recently reminded of those tacos and figured I would try and make my own. I used my favorite ground beef taco recipe for the filling. I'm not sure if the kind you buy are sandwiched together with just cheese or if it is a cheese sauce? I opted to go the lazy route and use regular shredded cheese. I thought these turned out yummy, but next time I do want to try a cheese sauce. I like the idea of having the cheesy sauce ooze out when I take a big bite. I have also seen some sandwiched together with refried beans, so that would be great too. I served these with a side of this easiest Mexican Rice using green salsa instead of regular salsa. Cut flour tortillas, using a pizza cutter, to fit around the corn shells. Top entire surface of flour shell with shredded cheese and place in the microwave for 5-10 seconds or until cheese is melted. Immediately fold the flour shell around the corn shell, pressing together to seal. 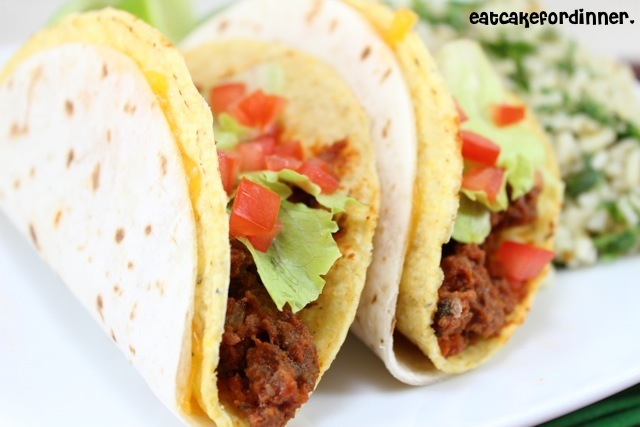 Fill corn shell with taco meat and top with desired toppings. Repeat with remaining shells. Serve. Great idea and looks so good! I want tacos now with that picture!!! I have only seen it done with beans and we don't like them so I have never even thought about doing it with cheese. It sounds kind of interesting!! 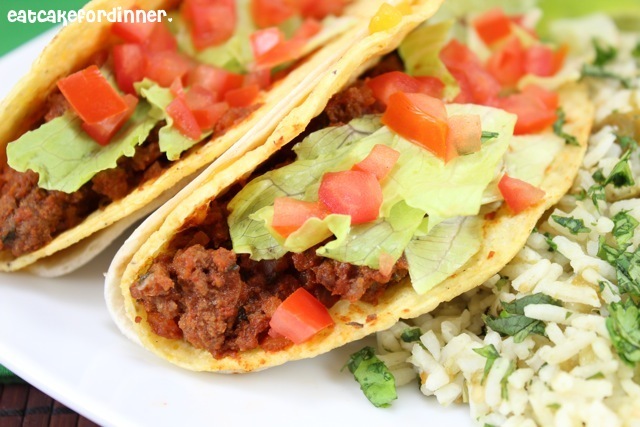 Of course, tacos of any kind are a family favorite :) Thanks for the great idea! I am totally pinning this! Tacos are my kids favorite food! I have to try this! Yum! This is easy and unique! My brother loves tacos and we are always up for trying a new recipe out! Thanks!